Cooking with my mom in Portland today. She taught me how to make “jiauzi” or Chinese style gyoza. Yum! The dough was made by hand. And the filling is a combination of shrimp, sole, green onion and chives. Fast and good for your heart. In a small bowl, mix together mustard, onion, balsamic vinegar and olive oil. 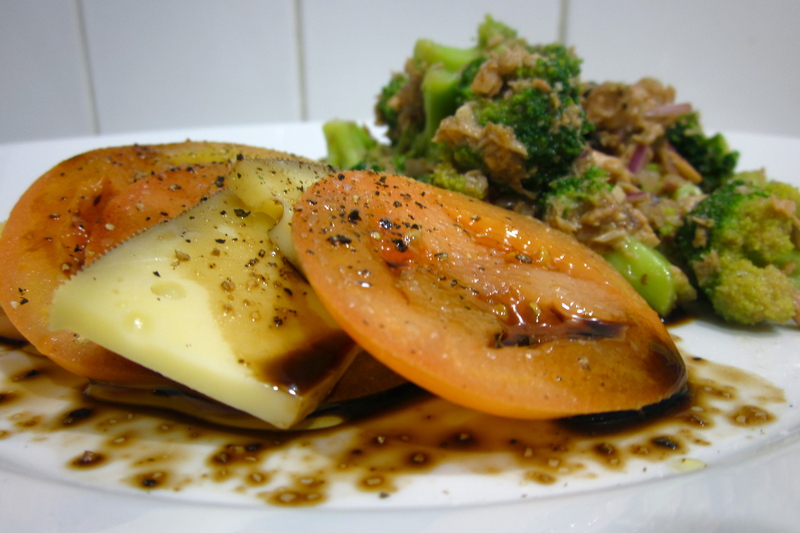 Stir in tuna, followed by broccoli and raisins. Sprinkle with salt and pepper. Adjust flavor to taste by adding more mustard, vinegar, salt, etc. 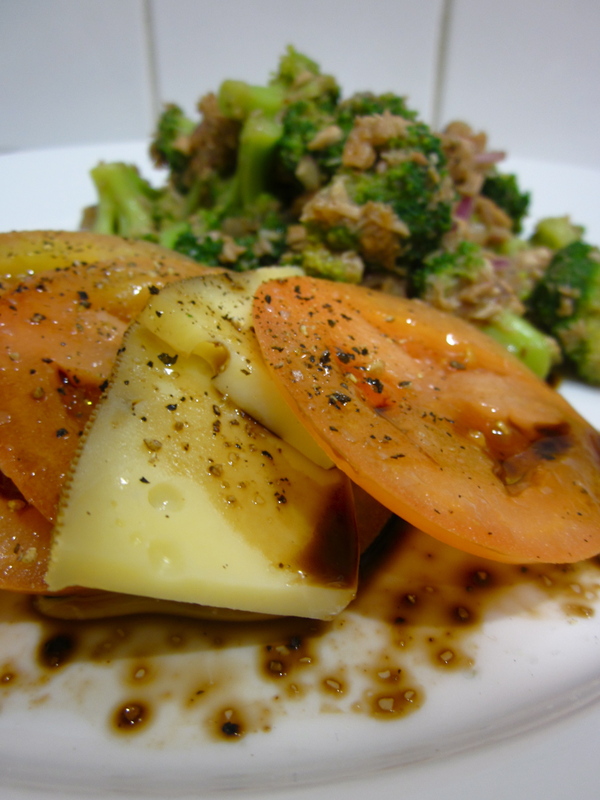 Serve along side tomato-cheese salad. Spiral out tomato and cheese in alternating layers on a plate. Splash balsamic vinegar and olive oil over the top. Sprinkle with salt and pepper. Quick din-din for one: Shakshouka. Wikipedia says it’s Tunesian. Thinking about it now, though, maybe it’s more Tex-Mex? 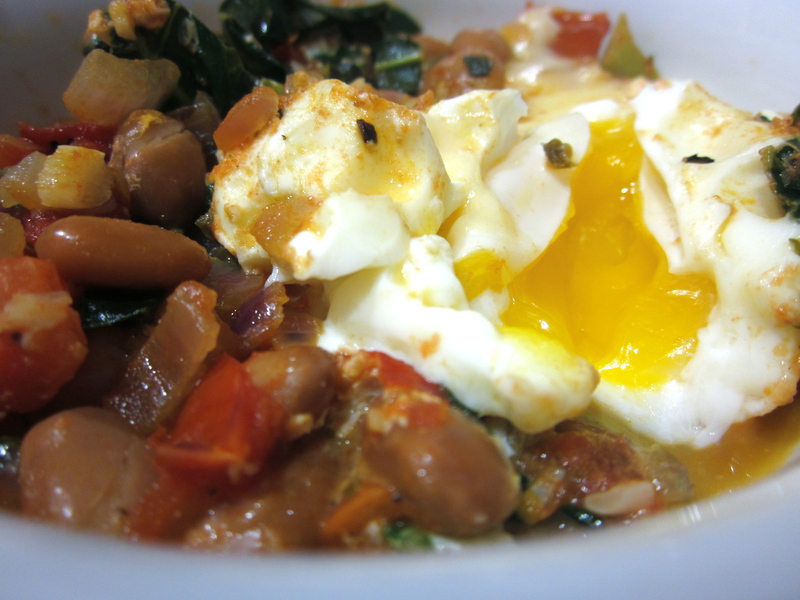 It’s almost like a low-carb Huevos Rancheros. I don’t know; I was hungry and threw together whatever was in the fridge. And this delicious, little dish was the result. In a pre-heated (medium-high) small pan or saucepan, sauté onion, garlic and mustard greens in olive oil until slightly golden. Then add in tomatoes, cumin, oregano, salt and pepper. Stir and allow to simmer over low heat until liquid reduce somewhat, ca. 5 minutes. Top with plain yogurt and eat! For someone who loves food so much, it seems odd to eat as much yogurt and cereal as I do. The fact of the matter is that cooking for one is booooring. Of course this bothers me. For one, it’s not exactly healthy. In a recent discussion with my friend Natalie regarding my carb and sugar diet of late, she told me, “I’m surprised you don’t look more like Jabba the Hut”. Me too. Second, it’s lame; it’s not like I don’t have the time, money or skill. And third, and most obvious, I am the Little Baker SF! and have a responsibility to blah, leafy greens, blah, organic, blah…you know what I mean. 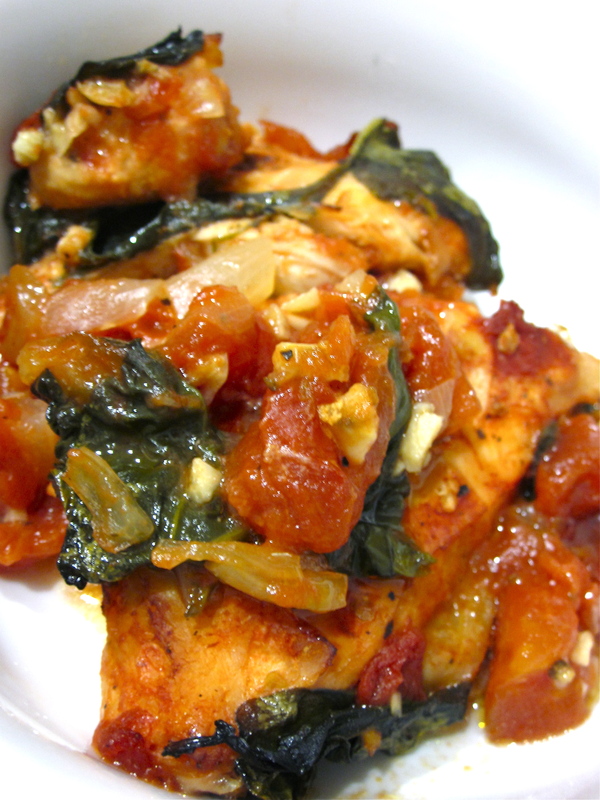 Chicken baked in a tomato-spinach sauce. There, my redemption dish. Easy, yummy and organic. 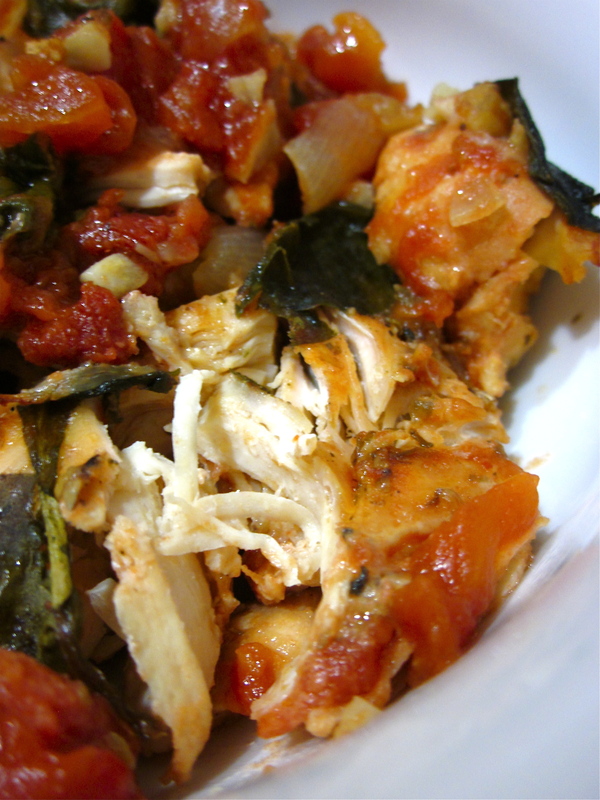 It’s not so quick–1 hour cooking time–but breast takes a long time to soften up. Using thighs would probably speed up the process. Pre-heat oven to 350 F. Rinse and pat chicken dry. Set aside. In a small bowl, mix together tomato, spices and onion. Then mix in the spinach. 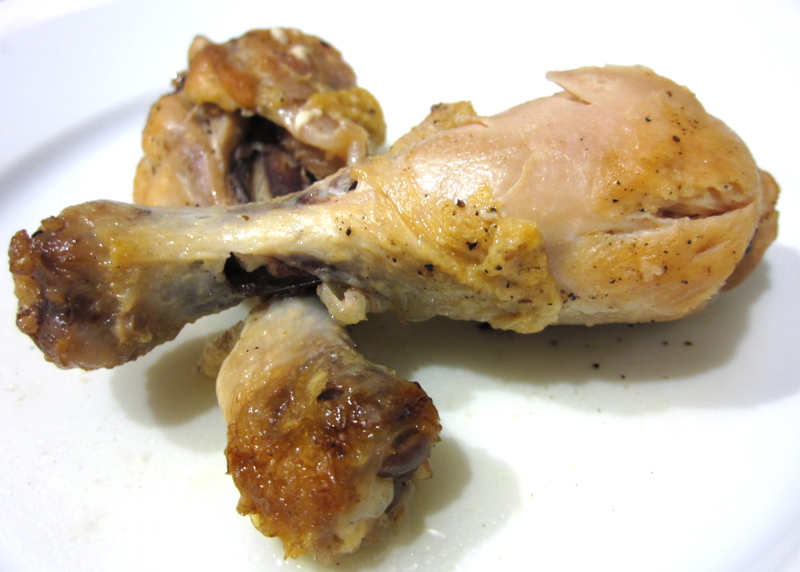 Place chicken in an ovenproof dish. (I used a glass pie plate.) Pour the tomato sauce over the chicken, making sure to coat completely. 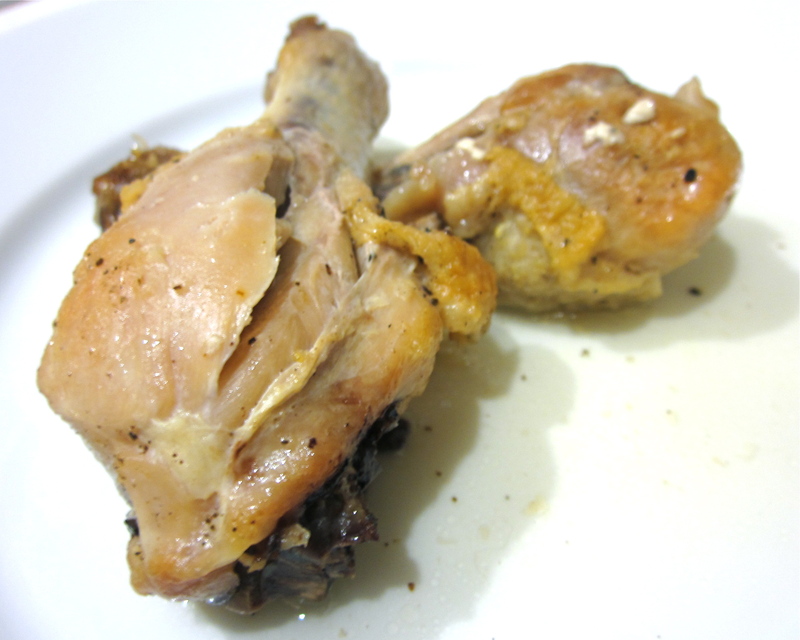 Drizzle olive oil over chicken. And season with a little more salt and pepper if you like. Cover dish with foil and bake for 50 minutes. At the midway point, remove foil and finish baking. Remove from oven, replace foil and let sit for 10 minutes before eating. I don’t really know what to call this. Except delicious. 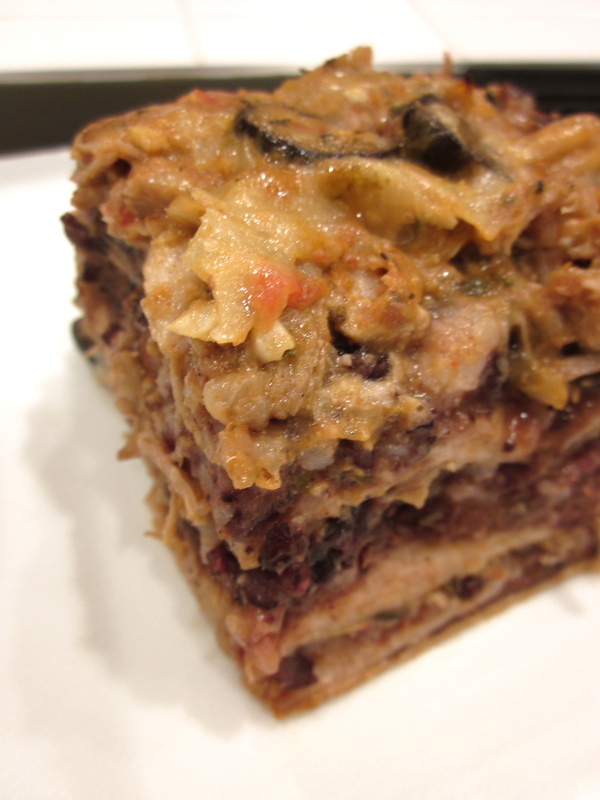 I saw a picture for a Seven Layer Tortilla Dip on Let’s Dish and was totally smitten at first sight. I didn’t follow the recipe, but it became my inspiration when putting together my version. Think of this dish like a deconstructed “super burrito”. Everything you love about those fatty monster wraps is in there: tortillas, refried beans, rice, spicy and tender shredded pork, and of course, lots and lots of cheese. My favorite part? The pork. It stewed and softened for three long hours, and then practically fell apart on it’s own as I shredded it. (Is it weird to get so much satisfaction from shredded meat? Seriously, it’s the best.) Another cool thing about this dish is the use of the braising liquid as kind of an enchilada sauce to pour over the finished dish. The juice, having stewed and developed for three hours, is craaazy—full of the flavor of the pork and all those aromatic herbs. It also saves you the effort of having to make another sauce. A little time consuming to prepare, but seriously worth it! Season pork with a little salt and pepper. In a medium pot, sear sides of meat in a little olive oil over high heat, about 1-2 minutes. (I did mine in batches, in order to maintain a high temperature in the pan.) Remove from pot and set aside. In the same pot, saute the garlic, onion, cumin, cayenne and oregano in a little more olive oil over medium heat. Once just golden, stir in the tomato paste and cook for another minute. Put pork back into pot, add enough water to just cover the meat, and bring to a boil. Once boiling, reduce the heat to the lowest setting, stir in salt, pepper and bay leaf. Cover and let stew until meat shreds easily with a fork, 2-3 hours. Test for seasoning; add more salt and/or spices to your liking. Remove from heat and allow to cool. Once cooled, remove the meat from the pan, reserving the stewing liquid for later. Use two forks or your fingers to shred the pork. In a small saucepan, bring stewed tomatoes and water to small boil; reduce heat to low. 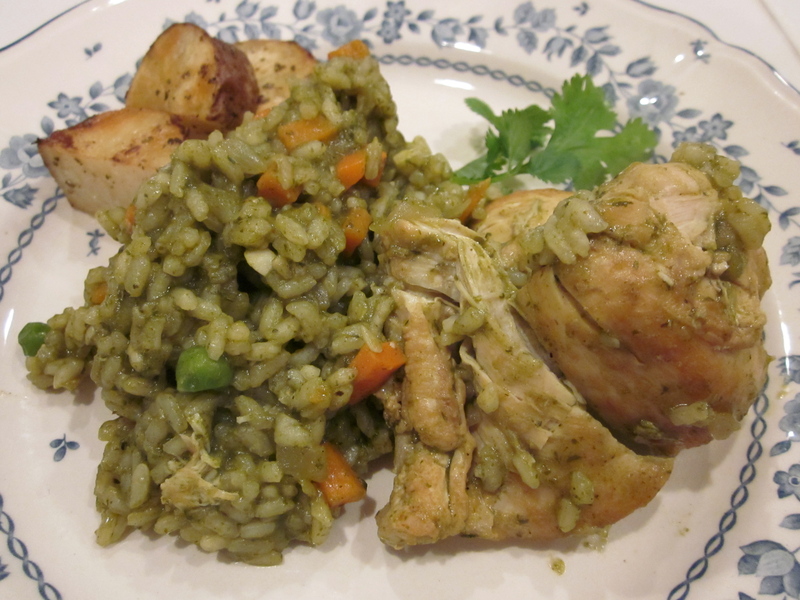 Stir in rice, cumin, oregano, and salt. Check for seasoning and add additional salt or spices if necessary. Cook until warm. Remove from heat. Line the bottom of a large gratin dish with two tortillas. (My tortillas overlapped a bit; I also cut them to fit better in the form) Next, spread one third of the refried beans over the tortillas, followed by a third of the rice, shredded pork, sliced olives and grated cheese. Repeat this process for the second and third layers. When assembling the final and top layer, wait to sprinkle on the cheese. Pour the reserved stewing liquid over the gratin, shifting around the dish to ensure the juice reaches the bottom. Now you can add the last layer of cheese. Cover dish with foil tent. Bake for 40 minutes. During the last 10 minutes of baking, remove the foil and allow the cheese to melt further and become golden. We met in Switzerland as pimply-faced exchange students; but then went out separate ways for university and work. Then last year—11 years later—we were reunited in San Francisco. She took me in as I nursed a broken heart and attempted to start a new life. And now is no different—she’s still taking care of me (and everyone else who needs her help). Natalie travels during the week for work, which leaves her pretty exhausted when she gets home. So to show my appreciation for all she does and will do for me, I made her this little weekend dinner treat! Hope she likes it! Pre-heat oven to 375 F. Toss and coat prepared squash in a splash of olive oil, salt and pepper. Roast in an oven dish until tender, 30-45 min. Remove and allow to cool. Once cooled, mash or food process until pureed. Set aside. Cook pasta according to package direction in salted boiling water until al dente. Drain and set aside. In a pan, brown sausage. Then, add in the garlic and onion and sauté over medium heat until just golden. Stir in spinach and allow to wilt down. Turn off the heat and set aside. In a large saucepan, melt butter over medium heat. Whisk in flour, continuing to do so for about 1 min. Slowly whisk in half the milk, completely incorporating liquid and flour. Whisk in the remaining milk, then reduce heat to low and continue whisking until sauce has thickened. 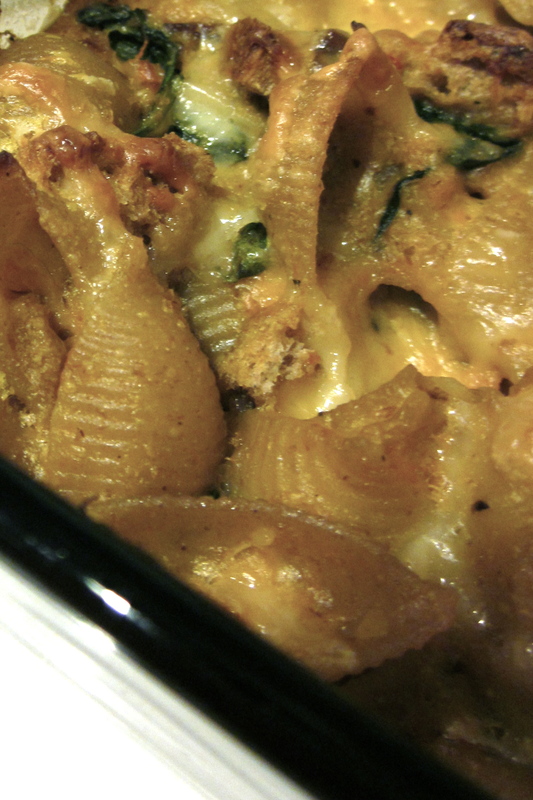 Stir in pumpkin puree, followed by the grated cheese. Season sauce with salt, pepper and grated nutmeg. Remove from heat. Finally, stir in cooked pasta shells and sauteed sausage until combined with sauce. Pour mixture into your casserole dish, sprinkle with breadcrumbs and bake for 30-40 minutes, or until bubbly and breadcrumbs are golden. What a meal this turned out to be! 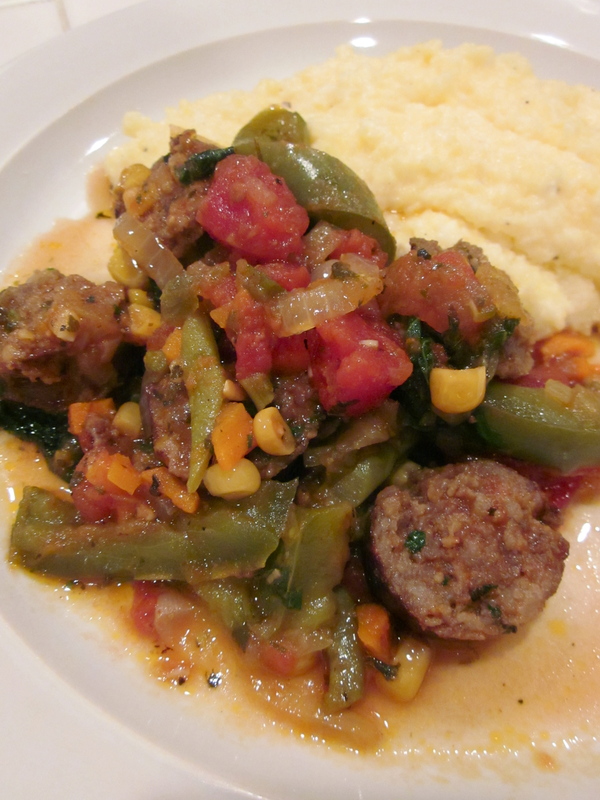 Sweet sausage and peppers with creamy polenta…delicious. 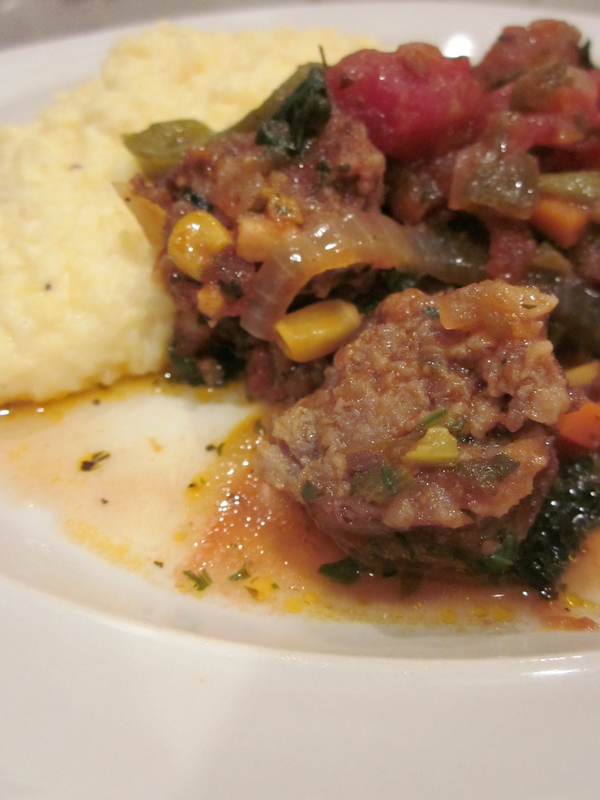 I should seriously make polenta more often—I love the feel of the smooth, tender grains in my mouth. It’s also way more interesting than plain old pasta. 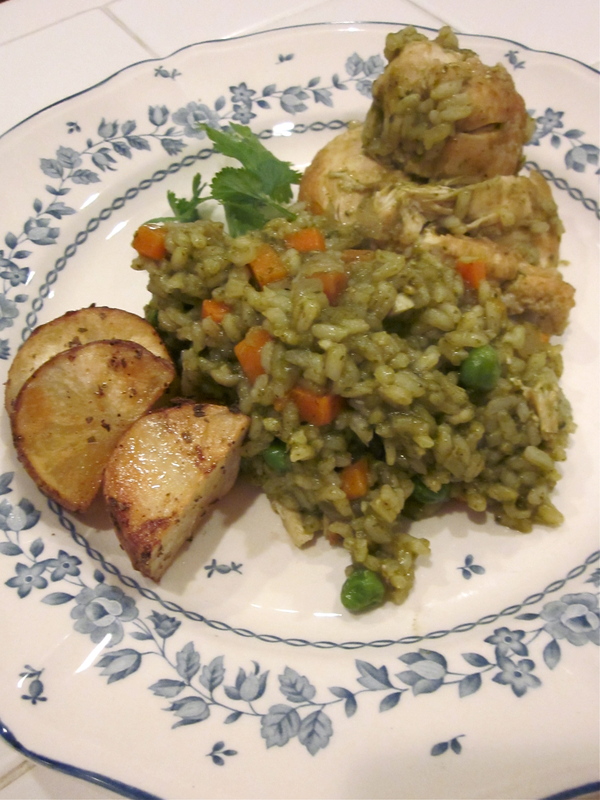 Apart from a few minor tweaks, I stayed true to the original recipes (found here and here). Keeping the pan over medium heat, add the peppers, onions, salt, and pepper and cook until golden brown, about 5 minutes. Add the oregano, basil stems, and garlic and cook 2 more minutes. Add the tomato paste and stir. Add the Marsala (or white) wine, tomatoes, and chili flakes, if using. Stir to combine, scraping the bottom of the pan with a wooden spoon to release all the browned bits. Bring to a simmer. Cut the sausages into 4 to 6 pieces each, about 1-inch cubes. Add the sausage back to the pan and stir to combine. Cook until the sauce has thickened, about 20 minutes. (I let mine stew for over an hour on very low heat.) Add the corn, if using, and chopped basil leaves, stir and allow to warm through. While the sauce is stewing, begin making the polenta. You’ll need about 45 minutes. First, bring the water to a boil in a medium, heavy-bottomed saucepan. Stir in the butter and 1/2 cup of the Parmesan, if using, and season with pepper. Cover to keep warm. Plate and serve with the sausage and peppers. This turned out so great! I love learning new dishes to cook when I am abroad and am always really excited to try it out at home. However, often my version never tastes quite the same. The source of the ingredients is different and sometimes, as was the case this time, you have to substitute less common ingredients with ones you have around the house. The aji amarillo chiles are really important for an authentic flavor, so I was worried about how my version would turn out. Luckily, though, it came out great. Actually, I think it was the lime that saved it. So, definitely don’t forget the lime! Pat the chicken dry; season with salt and pepper. Then in a large stockpot, brown the pieces in a little olive oil, in batches if necessary. (If you overcrowd the pot, the chicken won’t brown properly.) Remove and set aside. Also empty pot of excess grease. In your blender, liquidize the cilantro and aji (or in my case, mild yellow peppers), adding 1 cup of water to help in the process. Set aside. Once the rice is just cooked, stir in the peas and corn. Replace the cover for 1-2 minutes until the vegetables are warmed through. Just before serving, season for salt and pepper and then optionally, squeeze into the pot the juice of 1 lime. Or you can just serve lime wedges with the meal, which is how is normally done. Pre-heat the oven to 375 F. In a medium-sized mixing bowl, combine all ingredients and mix well. On a foil-lined baking sheet, bake for 30-40 minutes, or until golden and crispy.